The 2018 hurricane season has already brought two devastating storms, with Hurricane Florence causing major flooding in the Carolinas and Hurricane Michael causing extensive damage in Florida. The fallout from 2017’s hurricane season continues to affect many Americans, most notably in Puerto Rico. And flood disasters are not limited to hurricane events, as attested by the serious damage caused by flooding from Lake Ontario in 2017. CPAs should be familiar with how to assist individuals and business with the financial impact of severe flooding. The authors answer fifteen important questions regarding flood damage, flood insurance, and tax issues that arise as a result of loss from flooding. According to the National Oceanic and Atmospheric Administration (NOAA), in 2010 an estimated 123.3 million people, or 39% of the U.S. population, lived in counties directly on the shoreline. That number was expected to increase by 8% from 2010 to 2020. Water-rich New York has 2,625 miles of shoreline, along the Atlantic Ocean, Great Lakes, and Finger Lakes as well as its many rivers, streams, and estuaries, making the topic of flood damage relevant to many CPAs with clients living or doing business throughout the state. New York City alone has 520 miles of waterfront, with 8.5 million people at risk for flood damage. The spring and summer of 2017 saw Lake Ontario rise to an all-time record high. The shoreline devastation was extensive, with flood and erosion damage estimates in the billions; major cities such as Rochester, Toronto, and Montreal have been affected. The early fall blew in Hurricane Harvey, which brought devastation to Houston and the Gulf Coast of Texas. Harvey was followed by Hurricanes Irma and Maria, which severely damaged the U.S. Virgin Islands, Puerto Rico, and Florida. In August 2018, the town of Lodi, New York was devastated by a flash flood that was caused by heavy rains, while early September saw Hurricane Florence cause devastating floods in the Carolinas, and Hurricane Michael slammed the Florida panhandle in October. Considering the economic impact of natural disasters, it behooves the accounting profession to understand the risks and costs of these catastrophes. This article compiles a list of relevant questions and answers that will be of interest to CPAs advising individuals and businesses in flood-prone areas such as the shores of Lake Ontario, Houston, Miami, Naples (Florida), and New York City. 1. Is Flood Damage Covered by Insurance? Homeowners and business insurance generally do not cover the damage caused by a flood. A separate flood insurance policy must be purchased to ensure coverage. The typical business policy does not cover flood losses without a special rider that covers flood damage. Business insurance premiums are tax deductible, but homeowners insurance on a personal residence that is not classified as primarily rental property is not tax deductible. 2. Where Can Individuals Buy Flood Insurance? Some individuals are aware of the National Flood Insurance Program (NFIP) and believe they can buy flood insurance directly from the federal government. This is incorrect; flood insurance must be purchased from an insurance agent. In addition, the NFIP is available only in certain communities. An insurance agent should know if a community participates, or individuals can check community status reports at the Federal Emergency Management Agency (FEMA) website (http://bit.ly/2OrUI1J). Fortunately, many of the communities along the southern shore of Lake Ontario and other waterfront areas in New York, Texas, and Florida do participate in the program. 3. What Is Covered by Flood Insurance? Flood insurance policies typically cover physical damage to buildings and personal property. The most popular flood policies have limits of $250,000 for a home and $100,000 for the personal property contained in the home, with a $500 deductible. Individuals can purchase more flood coverage to extend both of those limits. Flood insurance for a business is usually $500,000 for the building and $500,000 for property, with a $1,000 deductible. 4. How Does One File a Claim? As with most other insurance policies, the first step is to contact the insurance company. There should be a phone number included in the policy to call when making a claim. Damage should be documented for purposes of completing a Proof of Loss form, which is required for the claim. Photographs of damaged property can be very helpful; take pictures of items both inside the property and of the property itself, which may have structural damage. Also document where the water levels reached at the high water mark. This could be challenging during a flood, as the duration of the high water can stretch into months, as was the case for the Lake Ontario flood. Individuals should not stay on property that looks or feels unsafe, however; if the property must be evacuated, take pictures before leaving and take more pictures when returning. Also, homeowners should be careful with electricity and floodwaters, and cut the power to flooded basements and docks before entering such waters to avoid electrocution. Make a comprehensive list of damaged and lost property and start looking for records such as receipts to document the cost of such items. (Unfortunately, for some property owners, receipts might also be lost in the flood.) All of these items will be helpful in completing the Proof of Loss Statement, which is required to file the flood claim with the insurance company. Make a comprehensive list of damaged and lost property and start looking for records such as receipts to document the cost of such items. 5. What Are the Steps in Filing a Claim and Estimating Losses? The insured will estimate the costs with an adjuster sent to the damaged property by the insurance company (called a scope visit). If contractors have been hired, they should be present during the scope visit as a check on the adjuster’s estimate of damage. After completing the inspection, the adjuster will inspect the loss and fill out a proof of loss form. The property owner must agree with the adjuster and certify the estimate with a signature. If the insurer agrees with the proof of loss form, it will compensate the property owner for the damages. 6. How Does the Property Owner Appeal if the Claim Is Denied? There are several courses of action available if an agreement cannot be reached with the adjuster or the insurance company. Working with the insurance company will usually get a quicker response than waiting and dealing with a large federal agency such as FEMA. So an insured’s first step should be to contact the adjuster’s supervisor at the insurance company, or try to speak with the insurance company’s claim examiner. file a lawsuit within one year of the claim denial. A lawsuit is a risky proposition. Once the suit is filed, the property owner can no longer file a proof of claim or appeal the denial. 7. What Losses Are Not Covered by Flood Insurance? Most self-propelled vehicles (such as cars), including their parts. Most personal property, such as clothing, electronic equipment, kitchen supplies, and furniture. 8. Can Flood Insurance Be Purchased during the Flooding Event? No. In fact, according to State Farm’s website, it generally takes a month or so from the date of purchase for insurance coverage to go into effect. Thus, flood insurance must be purchased before the flood damage. 9. Can Individuals Collect on Land Lost from Erosion or Deduct Uninsured Erosion Losses? Unfortunately, as stated above, damage caused by erosion is not covered. This is very disappointing for shoreline property owners who have lost part of their land. In order for a casualty loss to be deductible, the event causing the loss must be sudden, unexpected, and unusual in nature. Southwestern-Federal Taxation (Hoffman, Maloney, Raabe, and Young, Cengage Learning, 2019) specifically states that erosion due to wind or rain is not a casualty because it is not sudden. Since the Lake Ontario flood was long in duration (started in April and not cresting until mid-August), it may be difficult to argue with the IRS that this was sudden. 10. Can Uninsured Building Losses from a Flood Be Deducted? 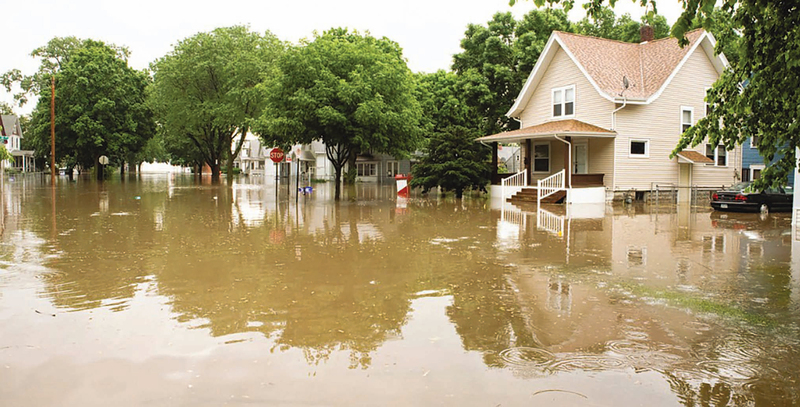 Uninsured flood losses are casualty losses and are deductible as an itemized deduction subject to a $100-per-event floor and a 10%-of-adjusted-gross-income (AGI) floor for personal-use property. Business or income-producing property is not subject to these floors. The Disaster Tax Relief and Airport and Airway Extension Act of 2017, however, adjusted the floors for victim of Hurricanes Harvey, Irma, and Maria; these losses are only subject to a $500 per event floor. As of this writing, there is no information from the IRS website for Hurricane Florence victims (http://bit.ly/2ypsxWZ) on whether this will be granted to victims of Hurricane Florence. The same is true of Hurricane Michael. The Tax Cuts and Jobs Act (TCJA) eliminated the deduction for personal casualty losses for the years 2018–2025, unless the loss occurred in a federally declared disaster area. Lake Ontario Flood victims can deduct their loss, as the flood occurred in 2017; however, if this flood occurred in 2018, they would not be allowed a deduction because the Lake Ontario flood was not declared a federal disaster area. Fortunately for the residents of Lodi, New York, their area was declared a federal disaster area. The Tax Cuts and Jobs Act eliminated the deduction for personal casualty losses for the years 2018–2025, unless the loss occurred in a federally declared disaster area. The amount of the loss that is deductible depends on the type of property and whether the property is partially or completely destroyed. Losses from all personal-use property, whether completely or only partially destroyed, are measured as the lesser of the adjusted basis of the property or the decrease in the fair market value of the property that occurred because of the flood. Losses of business or income-producing property that is only partially destroyed are measured in the same manner; however, the loss of business or income-producing property that is completely destroyed is the adjusted basis of the property at the time of the event. 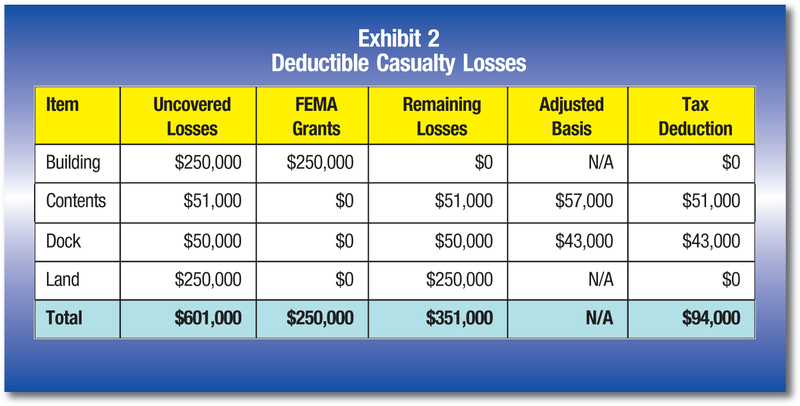 In all of the previous cases, the measured loss must be reduced by the amount of insurance proceeds received. If the event that caused the flood is declared a natural disaster by the President, then taxpayers may elect to treat the loss as having occurred in the previous year. By treating the loss as occurring in the previous year, the taxpayer can file an amended return and receive a tax refund to help fund some of their repairs (Hoffman et al 2019). As mentioned above, for years 2018-2025, in order for personal casualty losses to be deductible, whether in the current year or in the previous year, they have to occur in a federally declared disaster area. IRS Publication 547, Casualties, Disasters and Thefts, is a useful resource in this area. 11. How Is the Value of the Loss Determined? The insurance adjuster will go through the property room by room. The property owner should take pictures of all rooms and the property contained in those rooms. In the case of expensive items, document serial numbers, receipts, make, year, and models. These documents should be electronic and backed up to a cloud service. Useful resources include a spreadsheet, digital camera, laptop computer, tape measure, ladder, and flashlight. For purposes of deducting the loss on a tax return, the IRS requires an appraisal before and after the damaging event. Some victims, however, may not have a recent appraisal from before the event. In this case, the IRS allows a cost-of-repairs valuation method to determine the amount of the loss. Under this method, the cost of repairs cannot be excessive, and they must be able to restore the property to its original condition before the destructive event; for example, one cannot double the size of a building after the event and count the costs of expansion as part of the loss. Also, the repairs done cannot increase the value of the property to an amount that exceeds the fair market value of the property before the event. 12. Can a Property Owner Have the Property Tax Assessment Lowered Due to Land Lost from Erosion? Any homeowner or business owner can follow a grievance procedure to attempt to lower the property tax assessment if there are issues that affect the market value of the property. Taxpayers are only allowed to grieve the current assessment and cannot grieve prior assessments. There is no cost to file a grievance, and a lawyer is not necessary (although some lawyers do offer this service). Given that it is a low-cost endeavor, it may be worth the effort for many taxpayers. Any homeowner or business owner can follow a grievance procedure to attempt to lower the property tax assessment if there are issues that affect the market value of the property. Form RP-524, “Complaint on Real Property Assessment,” is available at the New York State Department of Taxation and Finance’s website and is used to start the grievance process. The form must be submitted to the local municipality by the grievance day. Grievance days do vary by municipality, so taxpayers should check with the local government to determine when the form needs to be submitted. Sometimes a taxpayer can have a conversation with the assessor before filing the grievance and reach an agreement to lower the assessment without going through the grievance process. Advisors should ensure that a taxpayer has some documentation to provide to the assessor, such as evidence of the amount of land that was lost. This could be documented with pictures or the survey of land when the property was purchased. Recent sales in the area that show a general decrease in property value would also be helpful. 13. Are There Government Funds Available for Individual Property Owners? FEMA can assist individual property owners in a federally declared disaster area. FEMA only provides assistance for a primary residence and not a secondary residence or vacation home; unfortunately, many beachside or waterfront homes are weekend cottages or vacation homes. Assistance is not provided for homes already covered by flood insurance; however, if the insurance does not meet the insured’s needs, assistance from FEMA is available. The insured will need to submit documentation from the insurance company regarding the amounts paid on any claims. Assistance can come in the forms of grants or loans. Grants do not have to be paid back, but there are restrictions on how the money can be spent, which are usually spelled out in a letter sent by FEMA. Loans are typically for small businesses and are provided by the U.S. Small Business Administration (SBA). Residents should also check with their local government as well. For example, New York made $95 million available for municipalities, individual homeowners, small businesses, farms, and not-for-profits for the 2017 Lake Ontario Flood. At the time of this writing, homeowners could apply for up to $50,000 for certain structural repairs. If the home is a secondary residence, however, homeowners who had qualified gross income over $275,000 would not qualify for the funds. The deadline to apply for these funds was September 29, 2017. It is important to advise clients to research such grants quickly after a disaster, as governments do place time limits for applications. Note that some grants are for specific events. 14. How Do Insurance Reimbursements, FEMA Funding, and Tax Deductions Interact? Consider the following example: Sue Smith owns a waterfront restaurant and marina in a federally declared disaster area. Sue was trying to sell the property and therefore had a recent appraisal done just before spring floodwaters damaged her property. The property was valued by an appraiser before the event as follows: building $1 million, contents $500,000, dock $50,000, and land $750,000. She carries a flood insurance policy with $500,000 coverage on the building and $500,000 coverage on the contents, with a $1,000 deductible. Sue’s coverage is so low because she failed to update her insurance policies as the business grew over time. After the event, Sue hired an appraiser who valued the items as follows: building $250,000, contents $300,000 (only contents on the first floor and basement were damaged), dock $0 (what is left of the wooden dock must be torn out and entirely rebuilt), land $500,000 (due to erosion and a general decrease in property values due to concerns about future flooding events). The flood insurance policy made a payment of $649,000, which included $500,000 for the building and $149,000 for the contents. $50,000 of the $200,000 loss related to the contents was denied because that portion of the contents was in the basement of the building, which is not covered; the remaining $1,000 was the deductible. The dock was not covered by flood insurance, as this was considered an outside deck. The decrease in value due to erosion was also not covered. This leaves Sue with a $601,000 loss (Exhibit 1) that was not covered by insurance ($1,250,000 loss − $649,000 insurance proceeds). After the insurance company processes her claim, Sue can apply to FEMA for further assistance. Suppose that she receives an additional grant from FEMA for her underinsured building loss of $250,000. This will leave her with a casualty loss of $351,000 ($601,000 uncovered loss − $250,000 FEMA grant). Although the property is business property and would not be subject to the $100-per-event and 10%-of-AGI floors applied to personal property, the full casualty loss of $351,000 would not be deductible. The $250,000 loss on the land due to erosion and a decline in market value because the land is in an area that could be considered flood prone is not deductible. This leaves a $101,000 loss to be deducted on the return ($351,000 casualty loss − $250,000 land loss), $51,000 of contents and $50,000 for the dock. Since the $51,000 of contents is business property that was partially destroyed, the IRS will allow a deductible loss of the lesser of its adjusted basis or the decline in market value after the event. Since the dock was business property that was completely destroyed, the IRS will allow a deductible loss equal to its adjusted basis at the time of destruction. Assuming the adjusted basis on the portion of the contents that were not covered by insurance was $57,000 and the adjusted basis on the dock was $43,000, Sue’s deductible casualty loss would be $51,000 for the contents and $43,000 for the dock, for a total of $94,000 (Exhibit 2). 15. Where Can One Find More Information? CPAs must understand the risks and likelihood of a natural disaster and advise individuals and businesses on how to mitigate the attendant costs. There are many areas in New York, and throughout the country that are at risk for flooding, whether caused by a hurricane or seasonally heavy rains. At a minimum, businesses should back up their important records and information in a secure off-site location. In addition, they might consider business interruption insurance. Heidi Tribunella, CPA is a clinical professor of accounting in the Simon Business School at the University of Rochester, Rochester, N.Y.
Thomas Tribunella, PhD, CPA is a professor of accounting in the school of business at the State University of New York (SUNY) at Oswego.